A resource planning tool revolves around resources, on contrary to a project management tool, which focuses on projects. And while resource planning isn't project management, project management resource planning definitely is something. Even if you prefer to call it resource planning in project management. Or resource management in project planning. If you want to do project resource planning, Ganttic is made for you. Even more so if you want the emphasis to be on resources. On contrary to popular belief, Ganttic isn’t a project management tool - it is a resource planning tool. The benefits of using the resource planning approach are great. You are essentially extracting the ever-changing variables and planning around them. This simply eliminates unintentional overlapping of tasks and the redundancy of making sure that a resource isn't a part of other projects' resource plan. Topped with a user-centric interface, the once overwhelming projects’ data becomes easy to handle in Ganttic. The decision of which is more suitable for your business lies in which makes your planning more efficient. A resource management tool revolves around resources, on contrary to a project management tool, which focuses on projects. Resources: Anything you use repeatedly for tasks in projects. Ranging from people and vehicles to equipment and locations. Tasks: Work that resources need to do to complete a project. Projects: Made up of tasks, which are carried out by resources. Susan is baking a cake for the wedding. The limitations of planning around projects include not being able to plan your resources’ time as efficiently. Many find themselves cross-checking a resource’s availability and work frequency across various projects. It is a time-consuming and redundant step that a resource planning approach easily solves. 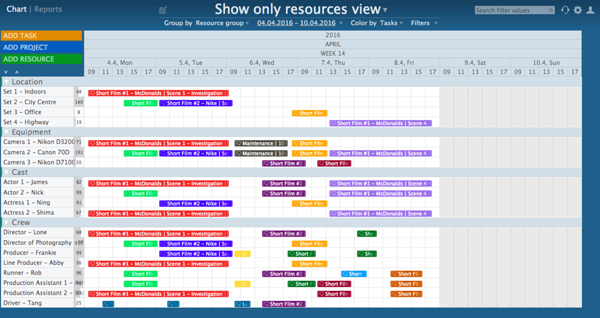 Resource planning in project management should be easy and flexible. 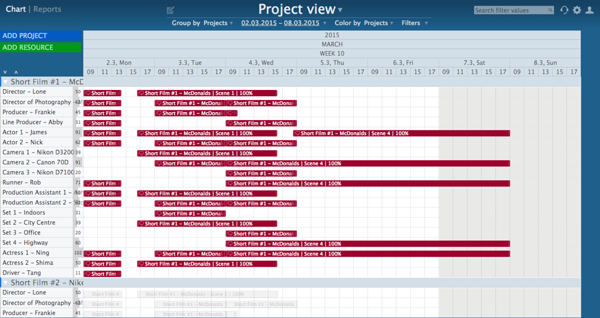 To allow flexibility, Ganttic has the project view feature that allows you to view data by project. In just two clicks, you will be able to scroll through all the projects and tasks that you have assigned your resources. It is easy to keep track of how each project is progressing while maintaining the ability to switch back to a more efficient way to plan across projects. All in all, we hope this clarifies the difference between resource planning and project management tools. Ganttic is designed around the user and cater to all needs across industries. If you are looking for a versatile solution for resource planning, try Ganttic for free or request a free personal demo.